Leading global supplier of marine deck hardware, Barton Marine, will be showcasing their new range of next generation blocks launched in 2018 at METSTRADE, from stand 01.478. Combining high performance engineering and contemporary design, the new range of blocks, available from Series 0 to Series 7 inclusive, have been designed for mariners who appreciate sleek styling and demand technical excellence. Crafted by sailors for sailors, the new Barton Block Range is manufactured in the UK, and developed with the same design endurance and bullet-proof reliability that Barton has built its reputation on over the last 70 years. Available with plain bearing or ball bearing sheaves, the new exterior styling displays dark slate side plates made of glass loaded nylon, which enclose a continuous stainless steel infrastructure for strength and durability across the line. 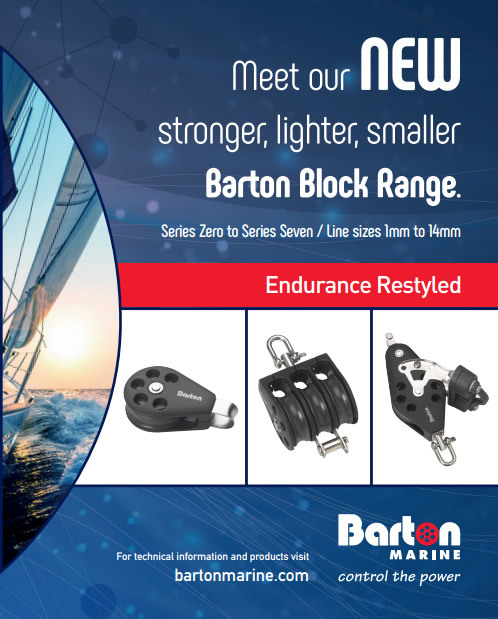 Designed for low friction and longevity in harsh marine environments, the new Barton Block Range is smaller and lighter, but exhibits greater strength and performance for overall reliability. The new range is now in production and will be officially launched at METSTRADE 2017. The range of blocks are available from Series 0 through to Series 7, in sizes ranging from 39.1mm to 88.5mm. POA. Our aim is to provide an appealing new Barton range that ticks all the boxes for today's sailors: sleek and racy design that is well engineered, stronger, lighter and provides the same longevity and performance Barton is known for. This is the largest product launch to date for Barton Marine, and we are excited to unveil our new block range at METSTRADE, the world's leading marine equipment show – the ideal platform for our global launch.